What did you like about the book? Wow, what a zany premise! A robot, in the form of a litter box, directs two cats in a robotic dog suit who go around saving people as a heroic dog. They are pursued by their nemesis, the Princess, who is a baby in diapers, attended by two beleaguered adults. Meanwhile, a stressed out reporter is trying to figure out how this super dog always manages to be in the right place at the right time. Clever, action packed and funny. Especially funny take on the archetypes of cats and dogs. To whom would you recommend this book? 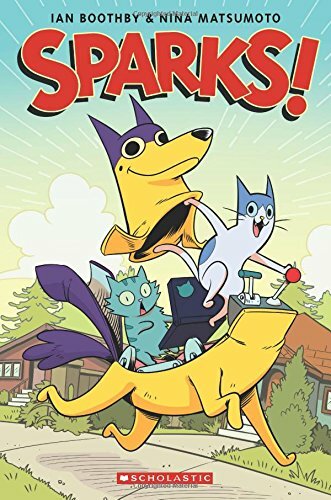 Kids who like Lunch Lady, Flying Beaver Brothers and Bad Kitty will enjoy this full length graphic novel. This entry was posted in Book Review, Fantasy, Graphic novel and tagged Scholastic. Bookmark the permalink.